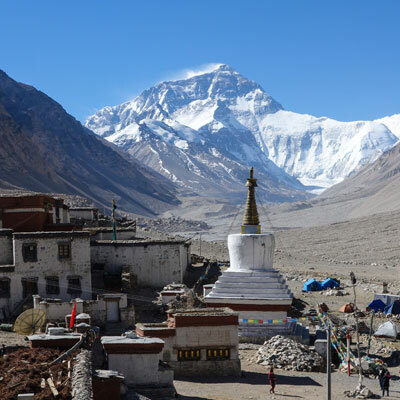 Shishapangma base camp trek with Lhasa tour is regarded as one of the best treks in Tibet, revered by Tibetans; it is seen as one of the most scared mountains in Tibet standing at 8046m. Mount Shishapangma is tucked behind the Langtang Range of Nepal. An easy 5 days trekking to Shishapangma base camp is one of the easiest treks in Tibet as it does not require crossing any high passes, but that does not at all detract from the fantastic views to rival any other adventure treks in Tibet. Mount Shishapangma in Tibetan means “the massive grassy field” which is that it is basically. 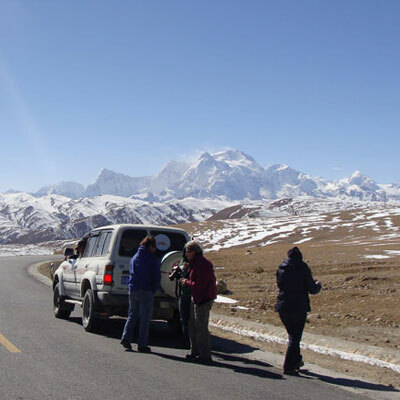 The trekking to Shishapangma base camp is combined on this program with an adventure overland journey to Lhasa. Shishapangma base camp itself is an elongated series of meadows wedged between ridges on one side and a river that drains from Shishapangma Yambukangala glacier on the other side. An adventure and long but very rewarding trek from base camp is the hike to the advanced base camp at the start of the glacier, although you have to very fit to make it back in a day. Another pleasant hike follows the crest of the ridge directly across the river from the base camp; from here there are some breathtaking views of the entire Shishapangma and Peiku tso Lake region. After completing Shishapangma base camp trekking we head for Lhasa and on the way we visit the Tashilhunpo monastery, the Gyantse fort and the Kumbum monastery in Gyantse. 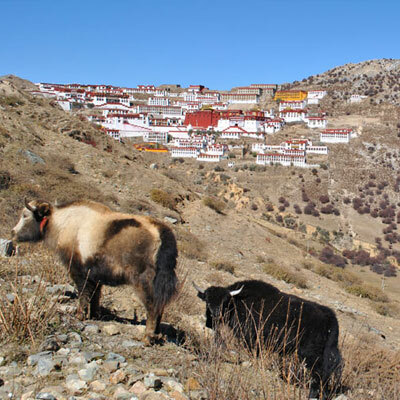 This adventure overland tour to Lhasa is enriched by numerous encounters with yaks and sheep herders along with turquoise lakes and the rugged beauty of the arid plateau. We will pass several high passes along the way to Lhasa with some awe-inspiring views of the Tibetan landscape that spreads before you. In Lhasa, we enjoy two days guided tour to all the beautiful sites including Potala Palace, Sera and Drepung monasteries. Our adventure Shishapangma base camp trek concludes with a breathtaking flight over the Himalayas to Kathmandu or amazing train journey to mainland China. 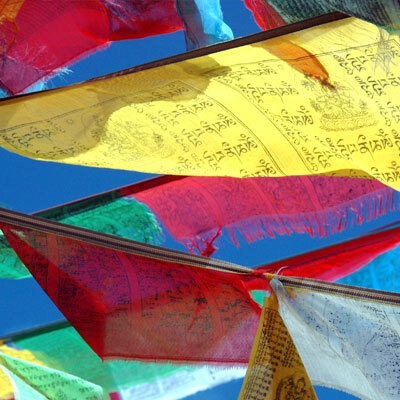 Day 14: Fly Lhasa/Kathmandu or train journey to mainland China. After breakfast at hotel, we start our journey around 7am from Alpine Eco Trek’s city office driving for 123km through the beautiful Nepalese countryside to Kodari on the Nepal - Tibet border. After completing the border formalities at both the Nepalese and Chinese immigration posts we drive up a series of incredibly steep switchbacks, which passes through a mossy gully with cascading waterfalls to Nyalam. Overnight at guest house. Today is a rest in Nyalam in order to acclimatize before heading Shishapangma base camp. A short way out of town there is a small temple, Nyalam Pelgye Ling, which is associated with eleventh- and twelfth-century poet-lama Milarepa. Overnight at guest house. After breakfast at guesthouse, we start our very first day of our trekking heading out of Nyalam and up along the Tshongde Phu river valley. After a couple of hours we have the choice to head directly up to Draabochhan or make a detour to the lake Tara Tsho. The pilgrimage route up to Tara Tsho is a long climb of two - three hours on a steep trail. The lake is quite large, though it remains hidden until you are fairly close. The shoreline is speckled with hundreds of small stone offering piles and larger Cairns with prayer flags. Tara Tsho has neither inlet nor outlet, it is said to be 40 meters deep. According to local legends, the lake manifested from a piece of ice brought here by a lama returning from Mount Kailash. We spend the night camping at the herders' camp at Draabochhan. After breakfast at camp, we start out by climbing to the top of a ridge; the climb is about an hour. From the top we walk parallel to the ridge, along some nice hills thick with dwarf rhododendrons. We end up in Shingdip a beautiful meadow camp with a large boulder near the junction of converging moraine valleys. The south base camp is only two hours away, but it is nearly 450 meters higher in elevation, so we stop here for the night. Overnight under tent. After breakfast at camp, from Shingdip, we take a cross-country route west towards the Base camp. Again today climb to a ridge and follow it for some time, with Jugal Himal towering across the valley to the south of us. We reach the base camp by a little glacial lake after two hours of walking. Shishapangma is out of view from the base camp, but we have plenty of time to head further up towards advanced base camp and explore around base camp, there is good views of Shishapangma on a boulder-plateau one hour above base camp. Overnight under tent. After breakfast, we trek all the way down to Draabochhan today; throughout the day we have a breathtaking views of Jugal Himal. We will walk through the beautiful alpine meadows and the dwarf rhododendrons on the hills. After a long descent we once again use the herders' camp in Draabochhan. Overnight under tent. After breakfast, we again reach lower and more fertile ground in the Tshongde Phu river valley, and soon we once again find ourselves in Nyalam. Overnight at guest house. After breakfast at guest house, we start our drive which takes us through the lush, green lower hills into the dry, arid landscape of the Tibetan Plateau. We cross several high passes including the Lalung La 5050m from which, weather permitting, there is a magnificent panorama of the Himalayan range including Mt Everest - a fitting backdrop to the vastness of the Tibetan Plateau. Overnight at guest house in Lhatse. After breakfast at guesthouse, we continue our journey along the Friendship Highway, we pass by lonely monasteries and the camps of nomadic herders. We then cross the highest pass of our journey, the Gyamtso La 5250m before descending once more to the barren splendor of the plains. Overnight at hotel in Shigatse, the second largest city in Tibet. After breakfast, we visit the Tashilhunpo Monastery, one of the largest functioning monasteries in Tibet, before setting off on the relatively short drive to Gyantse. Once in Gyantse, we can explore the Pelkor Chode Monastery and the Gyantse Kumbum. The Kumbum is a large gold-domed stupa and its many chapels house an exciting array of Tibetan Buddhist murals. Overnight at hotel in Gyantse. After breakfast, we start a very special day. Today’s drive will take us over the Karo La 5050m where we are treated to the awesome sight of a huge glacier tumbling down to within a few hundred meters of the road. 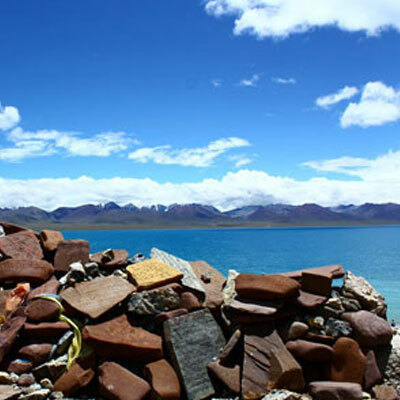 Beyond the small, developing town of Nagartse, the road follows the bank of a beautiful turquoise lake, the Yamdrok-tso, for about 20 Km. We then cross the Khamba La 4794m and continue on to Lhasa. Overnight at hotel in Lhasa. After breakfast, we will visit several of Lhasa's many monasteries in the company of a guide and supporting crew. One of these is the Sera Monastery, one of the best-preserved monasteries in Tibet. Within its whitewashed walls and golden roofs, several hundred monks live and study here. After lunch we will visit the Norbulingka, the summer palace of the Dalai Lama, as well as the Jokhang Temple. This temple is possibly the most sacred shrine in Tibet and there is always a procession of devout Tibetans through the complex. Surrounding the Jokhang is the Barkor - a maze of narrow cobbled streets, which is the central market of Lhasa. Overnight at hotel in Lhasa. After breakfast, we will visit the Potala Palace, which dominates the city of Lhasa. A spectacular building, it contains the private quarters of the Dalai Lama as well as numerous grand staterooms and many important chapels. There has been a palace on this site since the 5th or 6th century, but the present palace was constructed in the 17th century. In the afternoon, we will visit Drepung Monastery, founded in the 14th century, this monastery was once the largest in the world, with a population of around 10,000 monks. At the moment that figure is down to several hundred, but there is still much here of interest as it was left relatively unscathed during the Cultural Revolution. Overnight at hotel in Lhasa. Day 14: Fly from Lhasa to Kathmandu of train to mainland china. After breakfast, sadly we have to leave Lhasa early in the morning for the 2-hour drive to Gonggar Airport and our flight back to Kathmandu or your onward destination. Accommodation on twin sharing BB basis during tour as per hotel plan in Nyalam, Lhatse, Shigatse, Gyantse and Lhasa. Freshly cooked full board meals, continental: - any meals Chinese, Tibetan, and western style. 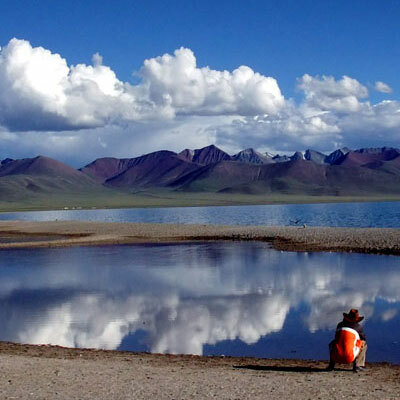 All the sightseeing tours in Lhasa & main cities in Tibet including Shigatse. English Speaking tour guide inclusive of private vehicle and all entrance fees. Lunch and Dinner in Nyalam, Lhatse, Shigatse, Gyantse and Lhasa. Our website contains as much information as possible about Shishapangma base camp trek with Lhasa tour. However, if you have any questions regarding trip, please feel free to contact us. We answer all enquiries within 24 hours. If you want to book a trip, you can send us an email or contact us directly by phone: 0977 98510 36844 (Ram Kumar Adhikari).